I Foodini. Episode 10. Dominica Edition. 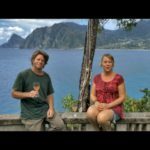 Adventures in Irie Cookery with Chris Warren and Jenn Andreoli. First in the series set on the island of Dominica in the West Indies.